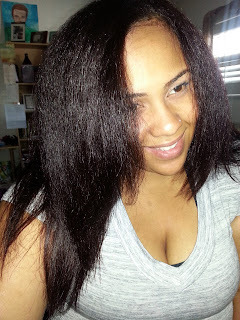 ﻿Heat straightening hair is a sore spot for many transitioning from heat damage. At best, we loved the silky straight hair. At worst, we hate the thinning and breakage aftermath from heat abuse, and currently are deathly afraid of ruining transitioner progress made to natural hair. But even with all that, almost every transitioner gets the hankering to straighten their hair every now and again. Here's how to do it safely, and ensure that your precious curls, coils, and kinks come back popping when you're tired of the straight look. Extended conditioning, deep conditioning, pre-pooing... I don't care what you call it, just start doing it a day or two before you plan to straighten your hair, if possible. Since I can't be taken seriously in meetings with my hair slathered in DC and covered with a plastic cap, I did my deep conditioning at night. After taking down my bun for the day, I spritzed my hair with Shea Moisture's Coconut & Hibiscus Hold & Shine Moisture Mist (water and oil), slathered on some Soft n' Free Nothing But Intense Healing Mask, put on a plastic cap, and called it a night. I chose the Intense Healing Mask because of the ability of behentrimonium chloride to soften and condition the hair, and help lay down the cuticle. After getting some conditioning action in, I set my sights on finger-detangling my hair about an hour before I was ready to start the straightening process. Not only does Step 1 help make this easier, but finger detangling in and of itself is one of the best methods to guarantee decreased damage and breakage. I personally use Tresemme Split Remedy Conditioner and water to tame my tangles, but feel free to use whatever super slippery products work best for your hair. When it comes to straightening hair, I do not recommend cowashing. While cowashing is a great way to gently cleanse hair between clarifying sessions, it does not completely remove buildup of products and ingredients on hair. This can be problematic in general, but especially when heat is involved. To successfully cleanse hair and minimize tangling, wash each section individually with diluted shampoo of your choosing, and clip/twist/braid it back up when done. At this stage, I personally use Ion Straightening Solutions Shampoo, diluted in a slanted nozzle tip botle at a ratio of 1oz shampoo to 8oz water. I chose this shampoo for straightening because it contains silicones and other ingredients that make it easier to straighten your hair when heat is applied. It is important to note that the shampoo doesn't alter your curl pattern in any way; it simply deposits silicones/polymers along the hair shaft that help "weigh" it down. Note: your hair won't feel greasy/oily weighed down, but you may notice that after a shampoo and condition with the Ion Straightening line, your hair seems to have more "weight" to it. It's hard to explain, and doesn't quite make sense...but if you're curious, try it. Deep conditioning is an absolutely pivotal step that cannot be missed. Not only will deep conditioning soften and smooth hair, it will also help impart and retain moisture that will be critical later on. Blow drying (if you choose) and flat ironing are drying to the hair, so your best bet is to get ahead of the curve with a great deep conditioner. Depending on my hair's needs, I start with either Palmer's Coconut Oil Formula Deep Conditioning Protein Pack, or Giovanni 2Chic Avocado & Olive Oil Deep Deep Moisture Hair Mask. After I've selected protein or moisture, I mix in the Ion Straightening Solutions Conditioner (for the same reason that I use the Straightening Solutions Shampoo). My concoction is generally about 50/50. I slather it on from root to end, throw on a Target bag (I have a stash...seriously), and sit under my hooded dryer for about 20 minutes. Tresemme Heat Tamer Spray contains glycerin, PEG-12 dimethicone, amodimethicone, PVP, centrimonium chloride, and propylene glycol. ApHogee Keratin & Green Tea Restructurizer contains trimethylsilylamodimethicone, PVP, glycerin, and centrimonium chloride. I spray both liberally on the hair (ApHogee first, then Tresemme), then blow dry each section of hair on medium heat. I'm sure by now, you already know about flat ironing in small sections, and not making too many passes over the same section of hair. Additionally, check out what Jc of The Natural Haven Bloom has to say about the best temperature for your flat iron to be on. I don't like to make particular heat setting recommendations, because each head of hair is different. Some of our favorite naturalistas are able to withstand temperatures in the 400s, while some barely use anything above 300. My flat irons personally sit between 350 and 380 degrees Fahrenheit. By the way, if your flat iron doesn't have a numeric temperature gauge -- it's time to chuck it. You need something that's going to give you a fairly accurate temperature reading in order to prevent heat damage. Low, medium, and high are not helpful at this point in the game. Before passing my iron over each small section, I smooth some Giovanni 2Chic Avocado & Olive Oil Super Potion Anti-Frizz Binding Serum (fancy name, a lot of fluff, but some solid heat protection), and put a little Garnier Fructis Sleek & Shine Moroccan Oil Treatment on top. Both are lightweight and silicone based, providing softness and shine. Giovanni contains dimethicone and amodimethicone, while Garnier has cyclopentiasiloxane and dimethiconol. All four ingredients act as a buffer between the heat (flat iron) and your hair, minimizing the transfer of heat. Additionally, because of their slippery nature, they allow for the flat iron plates to glide down your hair with ease, reducing the amount of time you have to hold the flat iron over each section of hair. Step 7: Wrap It Up! This little step I borrowed from back in the day when I was in high school, and used to go to the shop to get my hair done. The second I got home from getting my hair done, I would wrap it up and sit under the hooded dryer, to help "seal in" the job. So many years later, I find myself doing the same thing. After flat ironing, I distribute a little bit more of the above mentioned serums (Step 6) throughout, and wrap my hair with a satin scarf. Once I am sure all my hair is completely covered, I sit under my hooded dryer for 20 - 30 minutes. At a certain point in my hair history,my hair was "heat trained" aka heat damaged to the point where it was nearly relaxer bone-straight when flat ironed. But now, with all this healthy natural stuff atop my head, I know that the bone-straight look is no longer an option unless I desire to forfeit my curls. As a transitioner or new natural, it is important to realize that your hair when straightened will never quite look like it used to. You can get close, but unless you are willing to risk heat damage, you will have to settle for a "poofier" straightened look. Don't be discouraged, though! Straightened, healthy, natural hair tends to have more body and volume! It looks great straight, with curls, waves, or any kind of spin you put on it. Enjoy the versatility of your straightened natural hair! Every couple of days (or every night if your hair is super dry), part your hair in 4-6 sections. Rub 1-2 drops of Virgin Unrefined Coconut Oil in your palms, and distribute evenly over each section. Then wrap your hair for the night. Coconut Oil will help impart and retain moisture in your hair, adding softness and shine . By following all of the steps above, I have been able to successfully enjoy wearing my hair straightened, without getting more heat damage. What are some of your favorite steps to follow and products to use, to avoid heat damage while straightening? Very good advice! Especially the one with no co-Wash before flat ironing. You dont Want to "bake" in a lot of built up and product remains. Another tip is to be observant when you cook. Some oils are more reaistant than others. Olive oil is great with salad and cold dishes but hopeless at higher temperature. Coconut oil and sufflor oil is much more resistant and better to condition with before using heat. You can also try an air-dried roller set instead of blow drying which reduces heat usage and it stretches the hair. Thank You :) Your regimen worked well for me. Of course I tweeked some of the products. I liked the look. After 2 years no heat i was impressed how much my hair had grown. I definitely need to have my ends trimmed. Can I use coconut oil or olive oil before flat ironing instead of the hair serums?